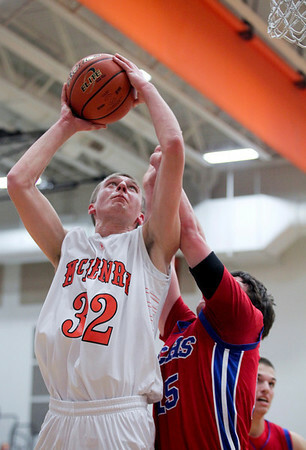 Jenny Kane - jkane@shawmedia.com Tues. Jan. 31, 2012 Dundee-Crown's Dylan Kissack tries to block McHenry's Jamie Rammel from making a pass during the final minutes of their game. 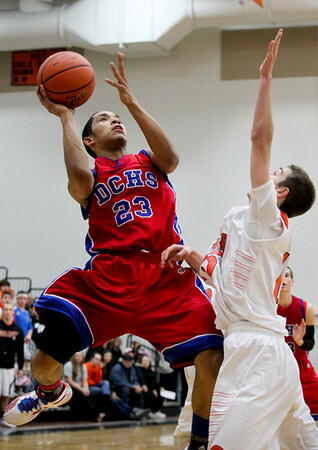 Dundee-Crown defeated McHenry 51-49 at McHenry. 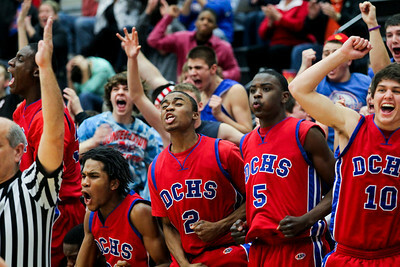 Jenny Kane - jkane@shawmedia.com Tues. Jan. 31, 2012 Dundee-Crown's bench cheers after a three point shot by Will Stupar to take the lead in the final minutes of their game against McHenry. 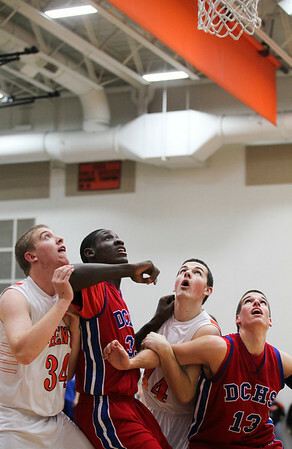 Dundee-Crown defeated McHenry 51-49 at McHenry. Jenny Kane - jkane@shawmedia.com Tues. Jan. 31, 2012 Dundee-Crown's Bruce Dantzler attempts a lay-up during the fourth period of their game against McHenry. 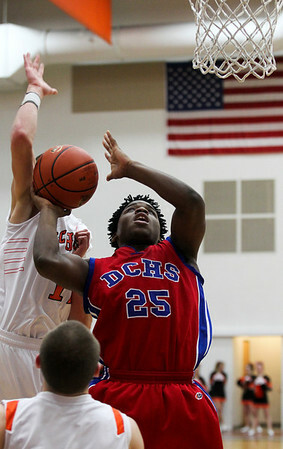 Dundee-Crown defeated McHenry 51-49 at McHenry. 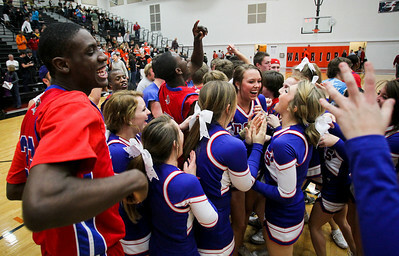 Jenny Kane - jkane@shawmedia.com Tues. Jan. 31, 2012 Dundee-Crown players, cheerleaders and fans rush McHenry's floor after defeating them in the final minutes of their game 51-49. Jenny Kane - jkane@shawmedia.com Tues. Jan. 31, 2012 McHenry's Robert Tonyan takes a foul shot after being fouled by Dundee-Crown's Thomas McNally in the first period of the game at McHenry. Dundee-Crown defeated McHenry 51-49. Jenny Kane - jkane@shawmedia.com Tues. Jan. 31, 2012 From Left to Right, Kevin Maher, Brandon Gordon, Andrew Reisinger, and Dylan Kissack wait to see if they need to get the rebound after a McHenry two pointer during the first period. 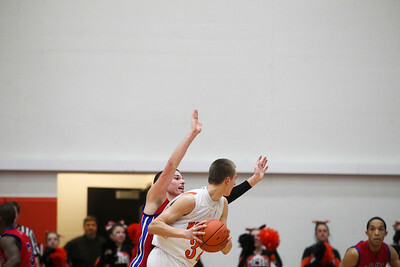 Dundee-Crown defeated McHenry 51-49 at McHenry. Jenny Kane - jkane@shawmedia.com Tues. Jan. 31, 2012 McHenry cheerleaders and fans watch as McHenry's drill team takes the floor for their half-time routine. Jenny Kane - jkane@shawmedia.com Tues. Jan. 31, 2012 Dundee-Crown's Thomas McNally tries to block McHenry's Jamie Rammel's shot during the second period of their game. Dundee-Crown defeated McHenry 51-49 at McHenry. 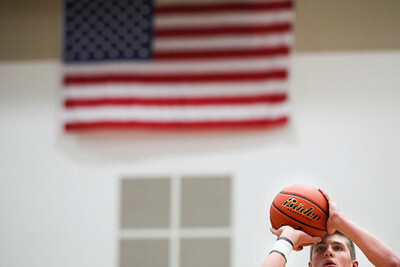 Jenny Kane - jkane@shawmedia.com Tues. Jan. 31, 2012 Dundee-Crown's Brandon Rodriguez attempts a lay-up as McHenry's Danny Glick tries to block his shot. Dundee-Crown defeated McHenry 51-49 at McHenry.